Hitting Disaster 80 years early. Warnings are too Rosey. Re: Hitting Disaster 80 years early. Warnings are too Rosey. Action to move cities or to protect them will not happen till the need becomes urgent. This is normal human nature. However the idea that all humans are gonna die (apart from old age) is a religious statement, not one based on science. No its not. You've been told 7 times what it "is" even once in the last 2 days? Are you confusing what you disagree with with what it IS? Or does only your opinion on review count and the authors interpretation in opposition has no merit at all? Stupid and lazy. The deniers creed. of the damned foolishness that is alarmism. Gee landrew: I still don't see any copy and paste of what you mean. Two examples on this forum of people like you being challenged to produce what it is that is motivating them, and the comeback is: "Sorry, I got it wrong." Just as you, Bobbo, cannot back up your extreme alarmism. Sure, we all know AGW is real and will cause major problems. But there is no evidence whatever that it might lead to human extinction. That idea is essentially religious. That is, it is based on a kind of faith, belief with no evidence. And of course the alarmists have ruined their own credibility by constantly overstating the problems, and making dire predictions which come to pass unfulfilled. The result is a large part of the population who have lost trust in whatever they say. They don't even seem to realize that they've shot themselves in the foot. They are unwitting traitors to their own cause. You want citations for this? All you need is to open your eyes. derp. Neither of you have the mustard to post anything specific. Choose your own word for it. You'll call it climate denial, but its just an honest accounting of all the hysterical nonsense that has derailed the climate change movement, setting it back decades. Give the adult approach a try, you might find it works better than the tantrums that probably worked on your parents and probably explains your behavior today. Last edited by landrew on Mon Feb 11, 2019 4:52 pm, edited 1 time in total. There are none. You have to have a train on the track before it can derail. There has never been a climate change movement worthy of the notion that it has been derailed: it was prevented by Big Oil right from the start. Getting the train on the track is my goal. A few years ago, lawsuits against Shell Oil et al were in the news re their scientific fraud preventing AGW action but I haven't heard about it lately (a few years). The only thing close to any derailment of anything has been ACCOMPLISHED by the status quo forces like the "Clean Coal" movement of some years ago. Or the State of Florida banning even the mention of the concept as Miami floods out. Like it or not, you and Lance with your Don't Worry position are just stooges as your comments demonstrate. All derailment, no substance. The problem with having a tribalist religious attitude is that it gives someone a bullet-proof shell of denial, which will probably go with them to the grave, unless they somehow see the light. Please refrain from the straw men. We have not sent the message don't worry. Let me repeat. I have always said that AGW is real, caused by human action, and that it is important that humanity act both to mitigate the problem and to adapt to what we cannot mitigate. That is not the same as telling people not to worry. But at the same time, there is absolutely zero reason to predict our species extinction. Your love of doom and gloom is not based on rational thinking, or good science. It is based purely on your own emotions. The primary problem is the carbon buildup in the atmosphere. AGW is secondary to that. It's a serious problem that needs to be dealt with, but hysteria won't help, in fact it makes things worse. One definition of insanity is repeating the same thing over and over and expecting a different result. 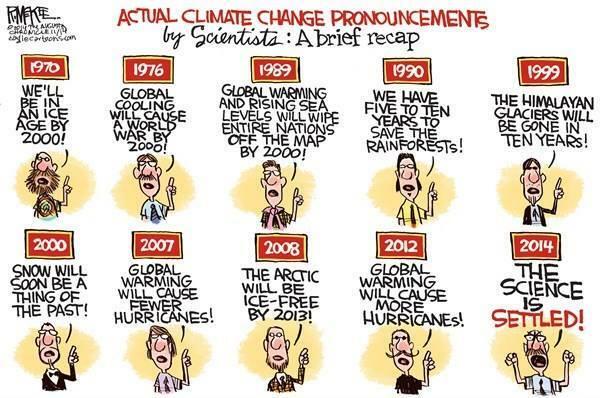 The result of constant hysterical alarmism is increasing skepticism by non-experts in the population who lose faith in those "climate experts" who seems to get it wrong every time they make a dire prediction. It's the law of diminishing returns in action. Alarmists have long passed the "tipping point" of the time when the public listened to their warnings. Now they largely go unheeded. Not really an intelligent strategy. I see that you're at a loss to refute what I'm saying. As I recall, you failed to do that the last time I talked about this. What is is exactly that you find wrong with my argument that alarmism is useless and counterproductive to public awareness about climate change? Anything at all besides straw-manning me as a denier? In other words, I have a consistent view. But this consistent view is based on good data. Sadly, your view is not. It is based on emotion. As I have told you many times, Bobbo, the history of humanity, and especially recent history, is of problem solving and a steady improvement in the way we do things. This does not deny that there are still problems. But one thing that has continued to fall is early deaths. Humans have never lived so well or so long. Even in what people term the third world, life span is about 70 years. 200 years ago, in developed nations it was 30 years. There is no hint of anything that will reverse this trend. The data clearly indicates that the great probability is for human life span to continue to become longer still, all around the world. It's a corrupt approach; believing that "any lie is a good lie if it serves the cause." In other words, any means to an end. It's corrupt because the means disqualifies the end. Any end that can't be reached honestly, is not an end worth reaching. It's just a house of cards built on lies. If you truly believe in the cause, you don't need to lie and cheat to serve that cause. It also speaks to the darker side of humanity, tribalism, which leads us to support anything "our side" says and does, while disbelieving everything the other side says and does. We can be better human beings than that. the view is fine. Its your endless repetition without nuance or recognition. Failure to answer direct questions, provide links. Everything said before..
You are that kettle of which you describe. The bankruptcy of your position is revealed in your frantic demands for citations which don't exist and can't exist. It's simple irrefutable logic that frustrates you, because you are never able to concede anything. landrew: you post untethered to the record right before you. simple doesn't adequately describe your silliness. Even Lance is better. You've done this with everyone on every subject except the just recent hybrid car discussion. A one subject pony? On this, Bobbo you are worse. Your pessimism is based on emotion, not data. 15th time: copy and paste where you think I have been pessimistic. Bobbo, do you not think "we are all gonna die " is kinda pessimistic ? I don't think it's pessimism because I don't think he believes it himself. He wants everyone to be hysterical and light their own hair on fire about his alarmist claims, otherwise he'll call them a "denier." Curios term that, similar to "heretic" or non-believer." You are close to the nub there landrew....thanks. I do absolutely think its going to be much worse that the rosy predictions of acclimation, tech, and accommodations with the losses being acceptable. We are not taking any steps right now to avoid that. I also DO think WE ARE ALL GOING TO DIE: if you assume all the worst case assumptions.....which cannot be ruled out. Knowing nothing, I too would take the average of all predictions, and guess that the worst case scenario is not going to happen........but that does not remove it from possibility thereby allowing for an honest headline. Hint: You get a lot more traction using accurate predictions than you do with wild exaggerations. No one agrees with you. You lost this argument months ago. As always: copy and paste any prediction I made you think is wrong. Your continuing failure to do this while still casting aspersions as you do makes you look very silly.............course, no one is looking, so you luck out there. STill.....there is the truth of the matter and your pride in being able to support what you say................or is there????? So far, the record shows no pride at all. Everything you type is wildly exaggerated. I can't copy-paste it because Pyrrho would ban me for flooding. You exaggerate rather a lot, Bobbo. Like talking of being forced to move cities within 100 years. The IPCC predicts sea level rise of half to one meter in that time, which is easily coped with using sea walls. A little while back you talked of widespread hunger because current crops do not grow well under hot conditions, even though scientific agriculture now has the best tools ever to develop crops that can grow more food than historically under any reasonable set of conditions. Good science requires accuracy. The excuse for exaggeration, that it is needed to promote urgency, is the mark of a crappy scientist. I have little patience with it, and I believe it is counter productive, as landrew has pointed out, because it destroys credibility and promotes the nonsense of deniers. And yes, you have frequently talked of everyone dying. I think the earth deserves a better quality of advocacy than the gang (tribe) of activists who are constantly shooting above their pay-grade. Spouting false facts, pseudo-science and shouting down more moderate and realistic opinions like a group of magpies, all for what they imagine to be a good cause. The cause may be good, but they aren't serving it well, obscuring and obfuscating the real debate that needs to happen. Back to the kiddie table, and let the adults deal with the world's important problems. Coastal cities will suffer, of course. This is part of what I said would be major disruption. But having to move inland is not going to threaten survival. You might note that a sea level rise of 80 meters, which is NOT predicted, would inundate less than 5% of the worlds land, leaving over 95%. By 2100, sea level rise will be more likely of the order of half to one meter. The wealthier areas will be able to build sea walls of perhaps 5 meters height to cope. Less wealthy areas will either grow their wealth (which is already happening. Bangladesh for example has about 5% economic growth each year. ), or else will be faced with a need to emigrate. AGW will be a serious problem and will cost a lot of money. But it is NOT a threat to survival. It is not a threat to civilization. Yes, there is a need to work to mitigate the warming. Yes, there is a need to adapt to the inevitable effects of that warming. No, it will not kill everyone. Let's throw a few facts in here. 39% of the world lives on a shoreline. 3/4 of the megacities are coastal. We still haven't fixed New Orleans, an obvious candidate for relocation. There is no plan. Capitalism does not include a plan for relocating 80% of the world's people. The plan is to let the poor people die homeless and the rich people fly off to their homes in the mountains. Your privileged ethnocentricity is showing Lance. This mass migration includes universities, research labs and farmers. The very people that you are saying will be solving all these problems. Kinda tough to do your CRISPR in waders. Sea walls don't stop water from finding its own level. They are much like border walls, they can be gone around. New York already was designed with constant pumping of water out of its subways. It was really short sighted. But why? Because we still rely on ports. Ports have been strategic for a few thousand years. They are so much part of the landscape, you don't notice. But go down to the docks anywhere and look at the investment in infrastructure. It took decades to build that up and it all depends on a consistent shore. Something we can't rely on right now. You're also welcome to visit Duluth, MN. Hopefully you understand that the polar vortex is caused by the warming of the North Pole. We're surviving this year, most of us, but just a few more inches of snow and little more ice and this city would be shut down. Ice storms aren't like hurricanes, they don't just blow by and get followed up by a warm day. Whatever damage they do has to be dealt with in freezing weather for weeks. But, that's just another "major disruption" to you. We'll be fine. Just a few old, weak and homeless will die. Good science requires accuracy. The excuse for exaggeration, that it is needed to promote urgency, is the mark of a crappy scientist. Have you ever tried to get someone to donate $2 to helping someone who is starving? Unless it is their neighbor, it is incredibly difficult. Once you point out that millions are dying, something triggers in the brain and empathy drops way off. Getting people to see the urgent needs of humanity is no simple matter. You don't need exaggeration, the actual numbers are mind numbing enough and people shut down when they hear them. I suspect this is what you are actually seeing, but you have made up a narrative where the facts aren't true. You see the problem, you see people not responding with compassion and rational thinking, and you don't understand it. You don't understand your own response. So you make up a theory about how the smartest people in the world are just bad communicators. Let's throw a few facts in here. 39% of the world lives on a shoreline. 3/4 of the megacities are coastal. We still haven't fixed New Orleans, an obvious candidate for relocation. There is no plan. Capitalism does not include a plan for relocating 80% of the world's people. The plan is to let the poor people die homeless and the rich people fly off to their homes in the mountains. Who's plan? This isn't some apocalyptic movie. Even as climate changes at an exponential rate (which it isn't) There won't be any mass exodus any time soon. Short sighted? Name a subway or underground structure anywhere that doesn't incorporate pumping. Groundwater is a fact. Doing CRISPR in waders? That's unrealistically dire by any estimation. Like I keep saying - not helpful. You can't have it both ways. Saying that both cold weather and warm weather are a result of AGW is fodder for the deniers. Overstating the situation with excessively dire predictions has the predictable effect of being less and less heeded over time. - Not helpful. What is ignored is that sea level rise is slow, and that 100 years in human terms is a long time. In that 100 years, sea level rise will be half to one meter, which can be coped with using methods a lot less drastic than moving entire cities. Maybe New Orleans but that place was a disaster from day one. We cannot predict what will happen beyond that 100 year period. Maybe we will get on top of things and sea levels will fall again. Maybe we will see a need to move cities. But right now that is pure speculation. What is for sure is that exaggerating things is not helpful. Good opinions don't ignore anything.